6 Changes in NPS in 2016 & How it Impacts You? 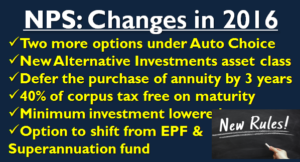 Until now you had following two broad choices while opening NPS account: Auto Choice & allocation to asset classes on your own. 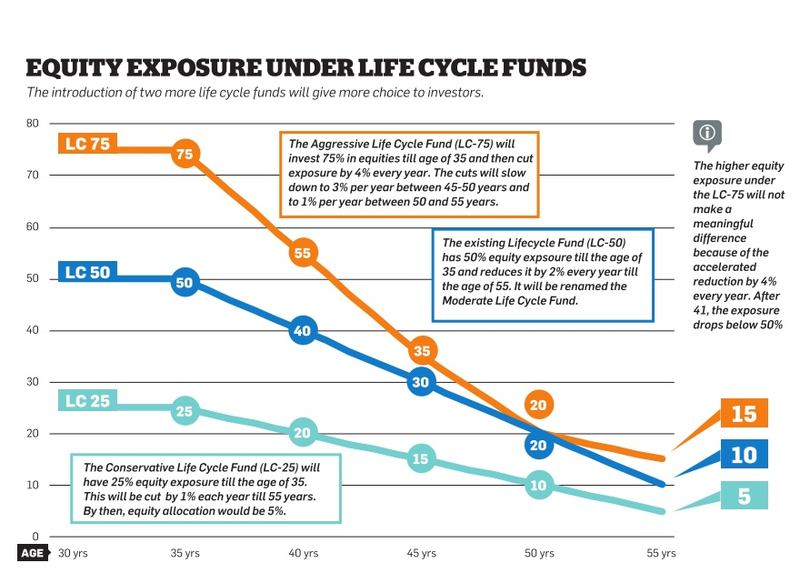 In case of Aggressive Life Cycle Fund, the equity exposure (E) is 75% till the age of 35 years and reduces by 4% every year till the equity exposure is reduced to 15% at 55 years of age. Henceforth the equity exposure remains at 15% till the maturity. This plan is suited for young investors who can harness the returns of equity and have enough investment time to manage the risk. In this case the equity exposure is 25% till the age of 35 years and reduces by 1% every year till the equity exposure is reduced to 5% at 55 years of age. Henceforth the equity exposure remains at 5% till the maturity. This plan is suited for subscribers who want low risk portfolio. In this case the equity exposure is 50% till the age of 35 years and reduces by 2% every year till the equity exposure is reduced to 10% at 55 years of age. Henceforth the equity exposure remains at 10% till the maturity. This was the existing auto choice is also the default choice for investors. Impact: I personally recommend to choose your own asset distribution, so this additional option is not much relevant. However its a good move for people who choose auto investment option. Impact: This is a complicated investment avenue and is difficult to understand for layman investors. Also mere 5% investment would not make any significant difference in the returns. My recommendation stick with the earlier asset classes only. At maturity 40% of the NPS corpus has to be used to compulsorily purchase annuity. Earlier you had to purchase the annuity at the age of 60 only. With the new rules you can defer the purchase of annuity by 3 years till the age of 63 years. Impact: This is a good move as not everyone retires at 60. Also the annuity payout is higher if purchased at higher age. This also helps people to wait in case they feel the annuity rates are not right at the time. NPS is EET product which means it’s exempted from taxes at the time of investment and growth phase but you need pay taxes at the time of maturity. Earlier rule: The 40% corpus which has to be invested in annuity is tax free. Rest 60% which was lumpsum withdrawal would be added to the annual income and taxed according to the respective tax slab. New Rule: Budget 2016 made NPS more tax efficient. The investment in annuity is tax free and only 20% of the corpus would be taxable on lumpsum withdrawal. Impact: Lower taxes is always good news! The minimum annual investment in NPS has been lowered to Rs 1,000 from Rs 6,000 earlier. This is to encourage even the lower income people to come into its folds. Impact: No impact on regular subscribers. Budget 2016 had proposed portability between EPF & NPS. The government has now allowed one time shift from EPF and Superannuation fund to NPS. After the switch to NPS you can still go back to EPF only once. Though shifting from EPF to NPS is still not recommended as EPF still offers above market interest rates and is completely tax exempted. 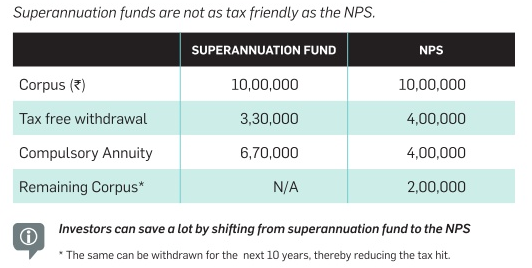 However it’s recommended to shift your Superannuation fund to NPS as NPS is more tax efficient and more flexible with purchase of annuity. In August 2015 too NPS had undergone major changes with respect to Maturity, Partial Withdrawal & Early Exit Rules.